If you’re the type of homeowner who likes plenty of natural sunlight inside the house, you may want to have a storm door from Windows Plus installed. 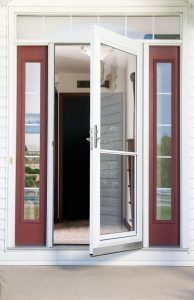 A storm door is mostly glass, housed by a durable aluminum frame, and installed in front of your main entry door so that you can keep your front door open without worry of insects or a sudden downpour getting in. If this sounds like an update you’d like to make for your home in Louisville, Kentucky, or southern Indiana, turn to Windows Plus. Windows Plus is a locally owned and operated company that is fully licensed, bonded, and insured. We’ve earned the trust of numerous homeowners in the area with our high-quality storm doors and exceptional installation services, as evidenced by our A+ rating from the Better Business Bureau. When you turn to us for a storm door installation, you can expect a quick turnaround and impeccable craftsmanship. Our installers are factory trained and specialize in only one type of product. So, you can rest assured that the team that shows up at your home in Louisville, KY, are storm door specialists with a deep understanding of best installation practices. With a proper installation, you’ll be able to enjoy your new door for years down the road. And, for exceptional peace of mind that your investment is protected, we’ll include a lifetime warranty with your project. To speak with a representative about having a storm door installed on your home, contact Windows Plus, where quality comes first, today. We proudly serve Louisville and all Kentuckiana communities.